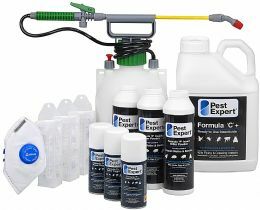 Our Advanced Carpet Moth Killer Kit contains everything you need to eliminate a widespread carpet moth infestation affecting a large area or several rooms in either a residential or business premises. The comprehensive range of carpet moth treatment products contained in all our Carpet Moth Kits has been specifically put together to help you carry out a successful carpet moth treatment, get rid of carpet moths fast and maintain long-term carpet moth control. The professional-grade carpet moth insecticides contained in our Kits are supplied by market leaders Rentokil, and Pest Expert and HSE-approved for DIY use, making them the most powerful carpet moth killers available to the amateur market, delivering rapid results. Our Advanced Kit contains a full 5 litres of carpet moth spray and a pressure sprayer, enabling you to treat an area of up to 125 sq m in a single application and achieve a thorough, even application of insecticide. All our Carpet Moth Killer Kits are supplied with step-by-step instructions on how to use the carpet moth products, making treatment straightforward and hassle-free. 1 x Pest Expert Formula C Moth Killer Spray 5 Ltr: The strongest carpet moth killer available on the amateur market, our Forumla ‘C’ spray kills carpet moths on contact and provides a lasting residue which protects for up to 12 weeks. This is a water based carpet moth spray, so won’t harm any furniture or fabric that wouldn’t be damaged by water. 3 x Pest Expert Formula 'P' Carpet Moth Killer Powder 300g: This permethrin dust is an ideal carpet moth killer for use around the edges of rooms and in other places where there could be eggs or larvae. An especially effective carpet moth solution if used along with the Formula ‘C’ carpet moth spray. 3 x Pest Expert Formula ‘P’ Foggers: Designed for safe use within the home, these foggers are an extremely effective carpet moth killer. They release and expanding insecticidal gas that penetrates even the hard to reach areas that could be harbouring carpet moths. Unlike smoke bombs, these foggers do not require a naked flame to work and so don’t present a fire hazard. 3 x Demi Diamond Moth Pheromone Traps and Holders: These professional standard carpet moth traps lure in male carpet moths with a special pheromone, trapping them inside and preventing them from reproducing with the females. An excellent way to monitor carpet moths before and after treatment, each pad lasts for up to 3 months. If you think your clothes may also be affected, wardrobe protection products such as Rentokil Moth Killer Hanging Units or Strips and Moth Proof Garment Bags can be also added from our extensive range of moth products. Didn't even have to use all of the products in the kit. Excellent! After two applications, I believe we have successfully eradicated them all! Ordered it on a Sunday, arrived I a Tuesday. Really easy to use. We had to use it throughout our house so took a while to apply the powder, vaccum up, then apply the spray. That was around a week ago and whilst we've seen the odd moth, mostly we're now moth free! Would recommend! great speedy, well communicated delivery system ....Your delivery communications and speed were much appreciated. I havent had the opportunity to use the product as yet, so cant comment on that. However, it was interesting to read an article in the Telegraph about changing moth pheromones, but apparently this option isnt available to the general public as yet. Satisfied Customer Very pleased with the product worked well and was delivered within the time stated. As there is an increase risk of pest or moth infections and many interesting discussions there is still a great deal of ignorance the life cycle of various pest infestations. What to do, what to use what works, what is safe Well here is the perfect box of pest removal tricks What is more important to remember is that pests and moths do return so knowing where to purchase further pest infection control reduces the concerns about future pest infections One can bring in experts to do the work for you or your can learn your self and be ready and prepared for any future concerns As a small business, my cleaners come in read the instructions and used the protective clothing. We all had a group Moth infection discussion we all agreed simple clear easy to follow the instructions and above all I would return back to use more MothKiller.co.uk Products. Happy As yet I don't know if the products have worked so far no moth's. What I can say is that the delivery time was excellent. Good value My products, carpet moth killer, arrived quickly and well packaged. Clear instructions on how to use. Reasonable value. Excellent service and top marks for communication Cannot praise MothKiller enough. Quick response time, excellent update re order status and first class product. excellent My order came quickly, very efficient. Pleased with the products, hope they work! Delivery as promised. Have used this product before and does work. THIS STUFF WORKS! Thankfully, the Carpet Moths have now been completely eradicated with the excellent Pest Expert products we bought. We had a nightmare of a problem, with an extensive infestation through much of our house due to the moths love of our wool carpets. We bought the larger / advanced kit and some extra 5 litres of Formula C, haven't seen any moths for weeks now, so great result. Carpet moth We used your product 2days ago and ( fingers crossed) have not seen a moth since. Thank you. After researching the best treatment I settled on MonthKiller.co.uk - it was easy to order, excellent service and a great product. So far I have not had any more infestations. The pack I ordered had everything I needed to hopefully get rid of the carpet moths I unfortunately had the misfortune to have at home. The kit had clear instructions of how to use all the tins, powders and sprays. The kit also includes the PPE required to keep you protected. Time will tell if the little blighters have been eradicated! Prompt efficient delivery, easy to use product. Not seen sight of the little blithers since. I had a few days off work and decided to have a deep clean. Started to notice the carpet had disappeared in some areas, on further investigation I could see something moving! I noticed the odd moth now and then, but didn't realise their offspring were actually causing so much damage!! After some research I went with mothkiller.co.uk and spent £90 on their products. With a bit of effort and following the instructions it has definitely made a massive difference. Products are very effective, just need to monitor our non paying guests!! This advanced pack contained Powder, Liquid insecticide and foggers. It arrived very quickly after ordering. Everything worked well and seems to have worked effectively. The pack came with a small hose to apply the liquid which was easy to use. Also provided was a protective suit & mask. At about £80 it was significantly cheaper than £1,200-£1,400 quoted by two large pest-control companies. Thus, highly recommended. Easy website to navigate and straightforward ordering process. Then e-mails at each stage of the despatch process to keep me informed. I found this product excellent. I had the full pack which was the best thing as it seems, fingers crossed, to have rid my house of those disgusting moths! Saved me a fortune as I honestly thought I'd have to replace my carpets. Would definitely use again. I needed some advice with a pest problem, the help I got was very useful. The pack was delivered within 2 days of order.as promised. Would recommend this company to anyone. Good price, good communication, fast delivery. Highly recommended. The full treatment kit was well packaged, the literature was clear and easy to understand. The package came with gloves, mask and full body suit which I wasn't expecting but did use. The treatments appear to have done the job; touch wood, so far we seem to have reduced / eliminated our case-bearing clothes moth problem. We had a bad carpet moth problem in nearly every room (3 bed) and the products bought worked wonders. Three months on and not a moth in sight. Would recommend following the instructions thoroughly for a good result. Moths. What moths? My daughter's room had carpet moths and clothes moths. I searched the Internet for information and how best to treat an infestation and chose the mothkiller.co.uk website. The site is extremely informative and it gives step by step instructions on the treatment process. This merits 10/10. Delivery of products was speedy. Again 10/10. The products purchased were easy to use and they came with easy to follow instructions. For this, 10/10. The products did exactly what they were supposed to - my home is now a moth free zone. 10/10. So far at one week does all it said on the paperwork needs tighter seal on the nozzle. I discovered carpet moth damage to 2 rooms and the edges of a hallway carpet. Having carried out extensive research on the internet, this seemed to be the best value kit with good quality chemicals. Overall, we were very impressed, the service was fast (next day delivery) and the products have completely eradicated the carpet moths! Excellent product. We had a bad carpet moth problem in nearly every room (3 bed) and the products bought worked wonders. Three months on and not a moth in sight. Would recommend following the instructions thoroughly for a good result.